Cynthia Meredith has been gardening with herbs, reading about herbs, and discussing herb gardening in Texas for more than 20 years. She has owned The Herb Cottage (www.theherbcottage.com) for over 10 years, selling herb plants to people all over our state. Spring seems to have arrived in south-central Texas. The redbud trees are blooming, as are our native bluebonnets. The bluebonnet patches around the yard have lots of flowers open. The foliage is so lush this year due to all the rain we've had. Bluebonnet patch in the foreground with a little redbud tree in background. Herbs are flourishing in the herb beds and in containers. Although it's raining today, we've had almost two weeks of sunny days. Just what we needed to make the herbs, flowers and vegetable gardens grow. Hanging pots of nasturtiums are blooming. I've been snacking on nasturtium flowers and leaves as I work around the nursery. I've given tastes of "nasties" to customers both young and old at the market and love to watch their faces as the peppery flavor hits home. What a cheery flower with bright red, yellow and orange blooms. Late spring nasturtium garden at The Herb Cottage a few years ago. Growing up in the San Francisco Bay Area in California, we had nasturtiums year-round. Here, they're a short cool season annual. I planted some in the fall, but the freeze took them out, as expected. It's a rare winter when nasturtiums make it through until spring. Planted now, however, nasturtiums will reward you with bright flowers and big, round green leaves until sometime in May or early June, depending on when the intense heat sets in. I've gotten them through summer in containers moved into deep shade, but they did not bloom and they looked thin and wasted. But they survived! And I had blooms in the fall. Tip: Use the flower petals in salads to brighten up both appearance and taste. Pull the petals from the calyx and sprinkle them on top of the prepared salad. The flowers also make a wonderful herb vinegar. You can also use the leaves in the salad too for a peppery bite. As the weather warms the soil, I look for signs of life on plants that froze during the winter. The big stand of lemon grass shows no new growth yet, and I'm not hopeful about the henna either. However, I have lemon grass in the greenhouse and some henna seeds I collected last year, which I'll try to germinate as soon as there is room in the greenhouse. Another casualty of our cold winter I think are my two big Kaffir or Thai lime trees. Small Kaffir lime tree. Notice the distinctive two-lobed leaf. Kaffir lime (Citrus hystrix) leaves are primarily used in Thai and Vietnamese cooking to add a pungent lime flavor to stir-fry dishes, sauces and more. I'll be very disappointed if the trees are truly dead. They finally produced fruit last year after about 10 years of growing. The fruit juice is sometimes used for flavoring. The fruit itself is bumpy, misshapen and very seedy. I planted about 15 fruits and if the seeds germinate I could have as many as 100 little Kaffir lime trees! 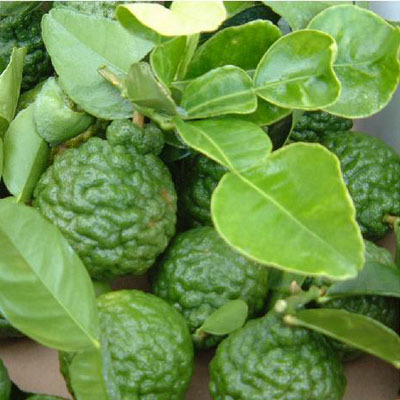 Kaffir lime fruit with leaves. It's still too early to give up on plants that froze back last winter. Some plants need very warm soil to start growing, which is why I've not given up on the lemon grass. Or the air temperature needs to be warmer for a longer period of time for the plant to put on leaves. Whatever the case, I'm hopeful I will see recovery of many of the plants that were severely frozen back. I hope your gardens are springing to life and giving you great joy and herbal treasures.